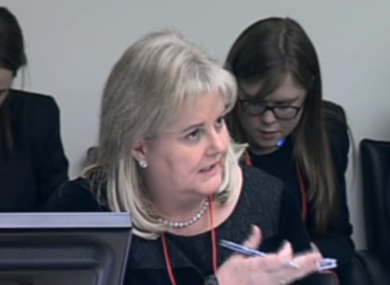 THE PUBLIC ACCOUNTS Committee (PAC) said today it is seeking more information from the Rehab Group as one TD this morning accused its CEO Angela Kerins of being short on detail during her appearance last week. Members of the committee have been discussing their seven-hour questioning of Kerins and her colleagues last week, with Sinn Féin’s Mary Lou McDonald saying Kerins had been less than forthcoming on certain issues. She said it was “deeply unsatisfactory” that Kerins had been “short on the full detail” and asked for more clarification around a number issues. These include details of the relationship between Rehab and the coffin company Eco Solutions Limited and Kerins’ and other Rehab executives’ use of helicopters – issues which have emerged in several newspaper reports in recent days. The PAC also heard complaints about the non-appearance of Rehab’s former CEO Frank Flannery last week after it emerged that he had been in Leinster House at the time of the committee’s hearings. There have been calls for Flannery, a senior Fine Gael strategist, to appear before the PAC over Rehab and this morning the committee agreed that an invitation to attend further hearings on the issue would be issued to Flannery and members of Rehab’s remuneration committee. Fine Gael TD Simon Harris said at the committee hearing this morning that he found it “quite offensive” that Flannery had not appeared before TDs last week. But McGuinness cautioned that Kerins had not made it clear whether her predecessor had been invited as part of the Rehab delegation which appeared before the PAC. Earlier in private session, the committee was told that details of salaries at Rehab, that the HSE disclosed to the committee last week, cannot be released publicly. However, the PAC is retaining a file handed to it under privilege by the HSE director general Tony O’Brien and exploring further options. McGuinness said that to date Rehab has not released salary information despite being of the understanding that the disability organisation would do so within days of having appeared before TDs last Thursday. In addition to salaries, further information is being sought from Rehab on a number of issues including the details of consultancy work that Flannery has carried out in recent years and his pension entitlements. Members also want details of a Towers Watson report on the remuneration of senior executives, a copy of the latest annual accounts of Care Trust and Rehab Lotteries and the percentages of Rehab trainees who complete courses with the National Learning Network. Details of the last bonus paid to Kerins are also being sought. She said last week she is entitled to, but does not take, a bonus of between 30 and 35 per cent of her salary. Kerins did not say if or when she last received a bonus. Email “Angela Kerins was ‘short on the full detail’, PAC wants more info from Rehab”. Feedback on “Angela Kerins was ‘short on the full detail’, PAC wants more info from Rehab”.